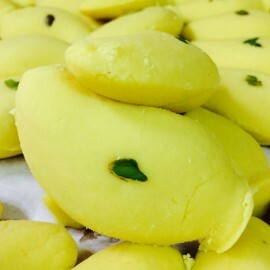 Gooli Sandesh as the name says is the traditional Bengali sweet. This Sandesh is a speciality Sandesh from the house of Balaram Mullick and Radharaman Mullick in Kolkata. A deliciously beautiful football shaped Bengali sweet. Even with the unique, the taste is quite enjoyable. A great melt in mouth delicacy. 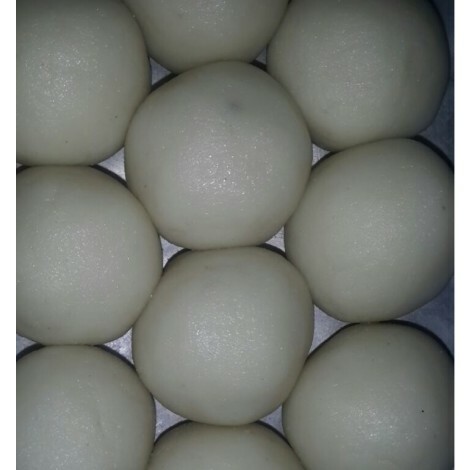 Balaram Mullick and Radharaman Mullick has been offering authentic and quality Bengali Sweets in the city of Kolkata since its inception in 1885. Balaram's has evolved from what was once just a makeshift hutment surviving only on the policy of counter sales to a throbbing venture of 5 generations.